Oh aren’t holidays such fun but getting there can be demanding. By the time you arrive at your destination, having experienced a security frisking, watched tv so close your eyes are pulsing, tried numerous different sitting positions and developed a cold from the recycled airplane air….you are knackered. 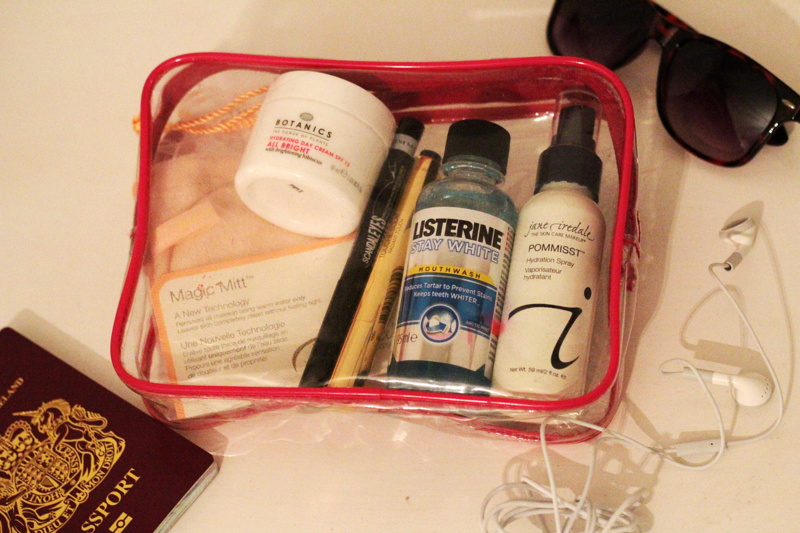 So here is my ultimate on-flight freshen up kit, so you can arrive at your destination looking and feeling as fresh as a daisy. First up Jane Iredale POMMIST (£16) – this isn’t your average facial spray, oh no, with ingredients like pomegranate, white tea and seaweed extracts this is so much more. This hydration spray quenches the skin which is exactly what you need when on a longhaul flight. The lack of oxygen in the cabin and the recycled dry air makes your face feel tight so a facial mist is a great way to hydrate the skin. 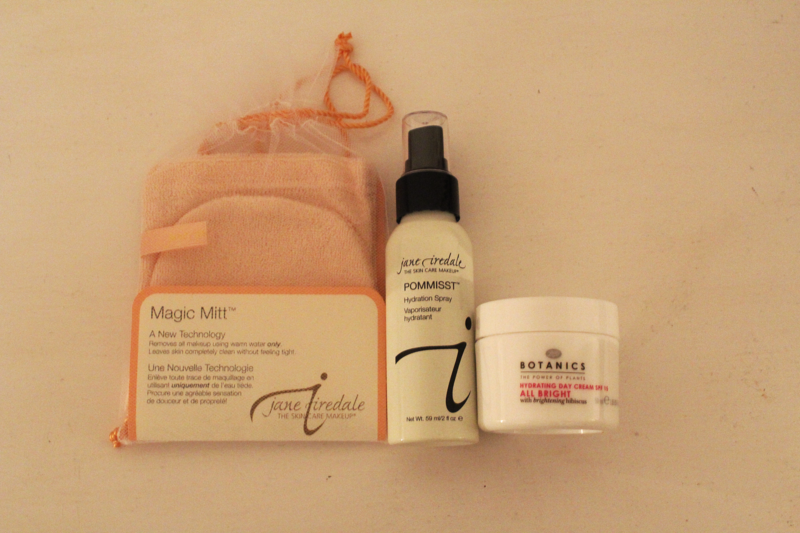 Also in the Jane Iredale range is the MAGIC MITT (£17) which removes make-up and grime with just water. So pop to the loo, dampen it with water and sweep it over your face to get an brilliantly clean and healthy complexion in seconds! It’s a great product to take away with you for your holiday too as it means no need for the faff of cotton wool and cleanser, instead just take the mitt and add water to remove make-up and cleanse the face. Moisturiser Botanics ALL BRIGHT HYDRATING DAY CREAM (£3.89) So now you have a facial spray, a magic mitt but you can’t go on a flight without a moisturiser. Botanics uses the power of plants to rejuvinate the skin, the moisturiser boosts moisture levels immediately and hydrates for 24 hours. This lil pot is perfect to dab on your hand and elbows during the flight to wake up the skin. 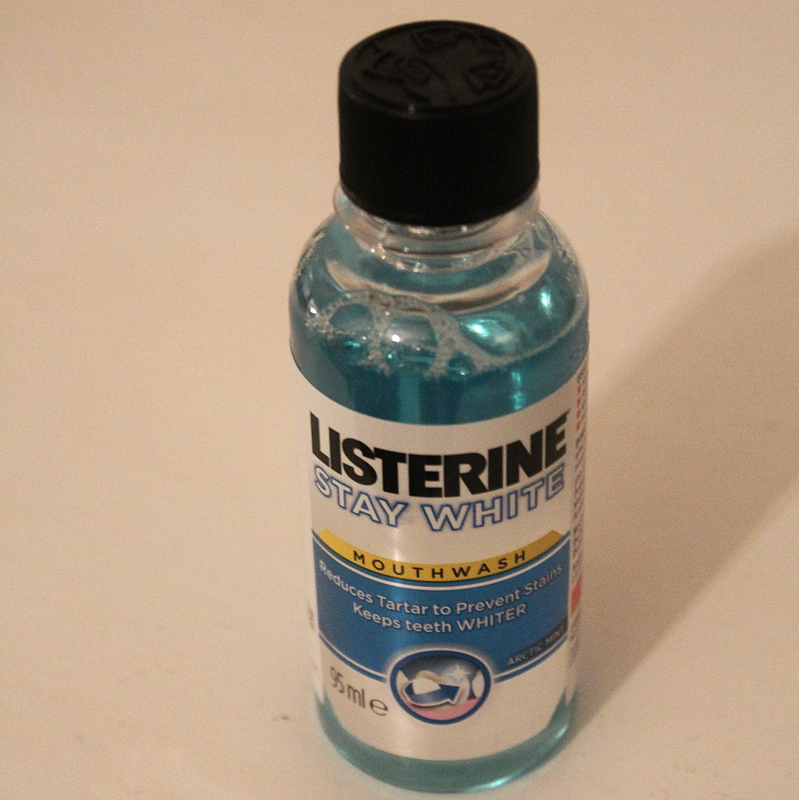 Listerine STAY WHITE MOUTHWASH (£1.01). As well as keeping your teeth naturally white, killing 97% of germs and reducing plaque lets get back to the basics….it freshens your breath! You tend to drink less on a plane (less bathroom trips), combine that with carb loaded aeroplane food your mouth needs a refresher. So take a swig of this to feel a bit brighter after your on board meal. 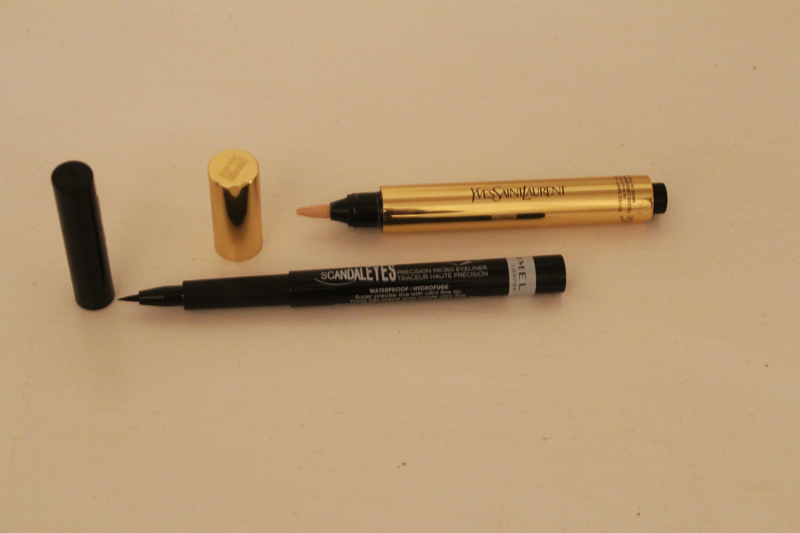 Rimmel SCANDAL EYES EYELINER (£3.99) If, like me, you can’t go anywhere without liquid eyeliner then this is the one to choose for your flight journey. Its fine tip gives brilliant precision, it’s so easy to use which is what you need when trying to apply it in a moving, cramped toilet cubicle. It is also waterproof so will last. I say go as make-up free as you are comfortable with and then pop these two products on (as well as perhaps some mascara) just before you finish your flight. And last but by no means least YSL TOUCHÉ ECLAT. I’m definitely a dark under eye sufferer so this lil wand is my best friend. This is one to leave till the end of the flight just swipe this from the corner of you eye around the base and dab with your finger to blend, and there you go no one would know that lil angel behind you kept you awake all flight. With this kit you should step off the plane looking like an international jetsetting superstar! Seriously? You’re skilled. There’s no way I can apply liquid liner in a moving plane! Yep it’s definitely a challenge!